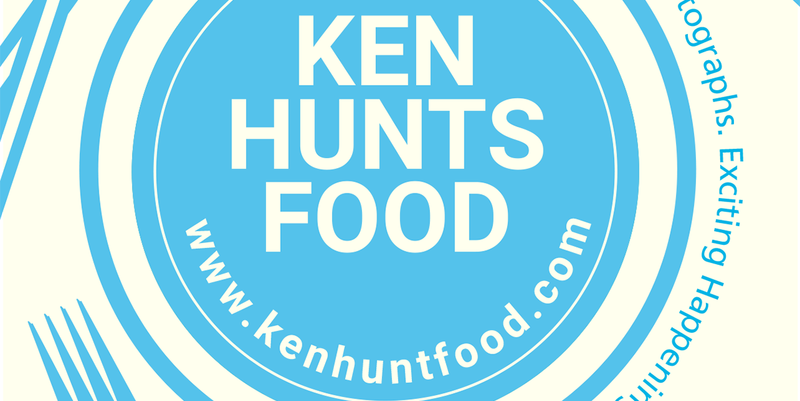 Ken Hunts Food: Wine & Dine Buffet Dinner @ Sarkies, Eastern & Oriental Hotel (E&O Hotel), Penang. 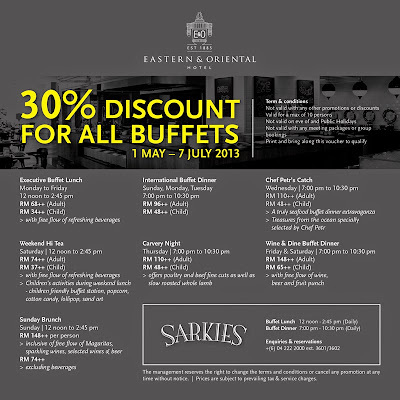 Wine & Dine Buffet Dinner @ Sarkies, Eastern & Oriental Hotel (E&O Hotel), Penang. These were the Wines and Beers available that night, diners are more than welcome to serve yourself any of the alcohol drinks to complement with the lip-smacking dishes. What's better than having some freshly shucked Oysters to go with the alcohols? However, it was a dismal that their home-made Tabasco sauce was no where to be seen, they were not providing any Lemon either, I would definitely prefer Lemon over Lime for the distinctive flavor which could further enhance the flavor and sweetness from the Oysters. I was delighted to see that they were serving Garfield Crabs that evening, something that are not too commonly seen in their buffet spread. Other Seafood available were Alascan Crab, Prawns, Mussels, Black Mussels and Crayfish. I had two small Black Mussels and unfortunately, they were not that fresh; I also had an Alascan Crab either and to my surprise, it was not as salty as the one I had few weeks back! Kudos to them for slicing the Salmon Sashimi thickly and they were extremely fresh and savory. Intrigued by the presentation of these two dishes, I was tempted to sample some of these. For your information, these fishes were meant to be eaten raw just like Sashimi. The one with Kaffir Lime Leaves (tasted very similar to Curry Fish but the fish was raw) fare better than the one with Sweet and Sour sauce (rather sweet with a hint of sourness); quite an acquired taste I would say. However, I would still prefer my Salmon Sashimi, simple yet tasty. The usual wide selection of Cheeses and the fresh Greens, I was in joy when I have found myself some Sun-Dried Tomatoes to go with my Coral Lettuce. I was not bothered to try any of the Cheeses as I have had enough Cheeses at the lounge earlier ago (to be covered in my up-coming post) but sadly, no round cream crackers were found in both places (they were providing square crackers only). I do patronize their Cold Cut Platter corner frequently that evening, particularly for their Smoked Duck Breast which was super tender and juicy, as well as their Turkey Ham which complemented my Coral Lettuce well enough. 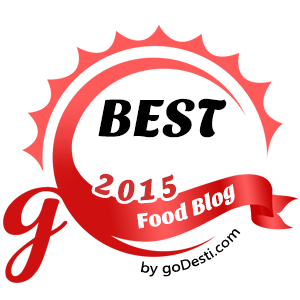 I strongly recommend their Smoked Duck Breast, a perfect dish to go with while enjoying your glass of icy cold Beer. The colorful and mouth-watering Grilled Zucchini, Asparagus and Mushroom caught my attention; I had some of their Grilled Zucchini few weeks back and was craving for more. The perfectly charred Asparagus is something shall not be missed either. The combination between Beef slices and Rocket that evening were somewhat inexplicable, but definitely in a delicate manner. My dad, being a huge fan of Roasted Duck, couldn't had enough of their Roasted Duck that evening. A literally divine and heavenly combination, Beers and Roasted Duck. Skillfully sliced by Chef Abdullah, the tender yet juicy pinkish Lamb was a subtle dish to go for. I would have asked for more if I were able to tuck in more. Other options available were Roasted Chicken and Beef. Clam lovers can go for their Curry Clams but I have opted to go for their Garlic Chicken instead; where they have sprinkled on with a generous amount of Deep Fried Garlic and Chopped Spring Onions. It may seem to be very flavorful and aromatic but sadly, it was not. It lacked of some flavors and the Chicken was not well-marinated. I had a small slice of Chicken Breast which turned out to be dry and bland too. This could be the best Salmon dish I have ever had. This Whole Salted Baked Salmon hit the top notch among the diners that evening. The experienced chef- Chef Ang was kind enough to crack and peel off the outer layer for me. The well-executed Salmon was cooked till fork-tender and pulsating with flavors, I can't help but to get myself a second plate, the unique aroma of Salmon just lingering in your mouth and tickling your taste buds asking for more! It was another surprise to see that their Chocolate Fountain is back to Sarkies again. I was told that the machine was down earlier ago, it seems like they have had the machine repaired. Marshmallows and Fresh Fruits were some of the available items for the dip. Their Meringue-Cheese Cake was a crowd-pleaser, moist and cheesy enough to my liking; although slightly on the sweeter side but still acceptable. The Meringue added a soft and fluffy texture to the Cheese Cake either. Thumbs up for this. The other dessert that one should look for is their Carrot Walnut Cake which came in very moist but not too sweet, flavor-wise, I would prefer a more intense Carrot flavor as it was obviously too mild for me. Well, the Chocolate Mousse with Baked Biscotti certainly seemed promising but I had to pass on that as I was too full after so many wonderful dishes. Many Thanks to Ms. Eileen Chong (Communications and Public Relations Manager) for extending the invitation and Mr. Jaya (Director of Food & Beverage) for arranging the buffet dinner review for me and my family. 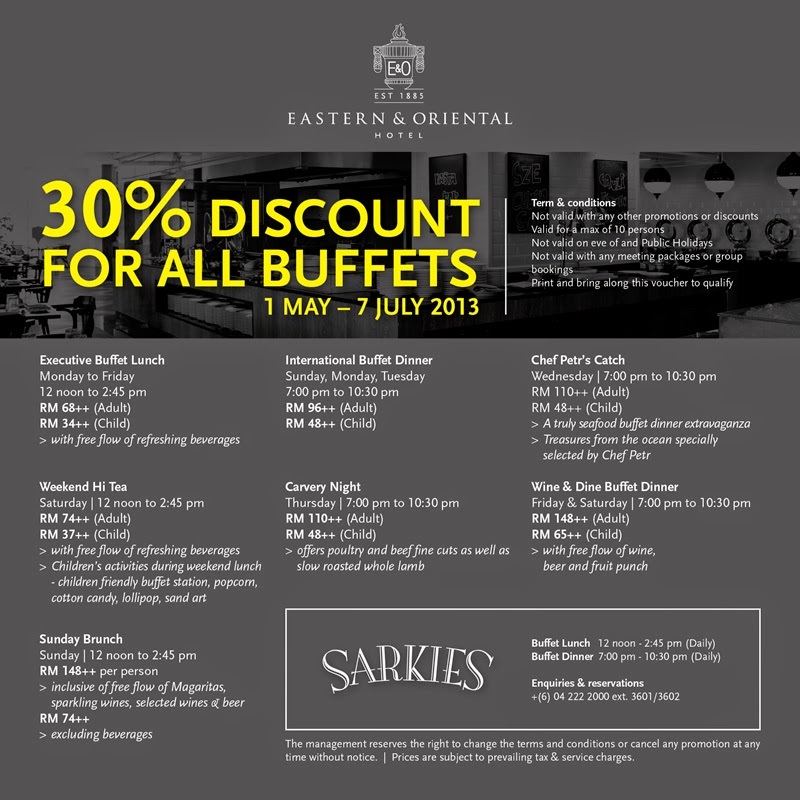 Effective until 7th of July, Sarkies is having promotion of 30% discounts on all buffets, simply print out the voucher and present to the counter to enjoy the discount. Please do check with the management or at least make an early reservation on the availability before making a trip there. Price: Rm 148++ (Adult), Rm 65++ (Child), every Friday AND Saturday, 7pm to 10:30pm ONLY.